Our house is still under construction and I don't plan on entertaining for quite a while. But since our daughter and her family hasn't seen the house yet, I made an exception and had everyone here for Shabbat and the weekend. After all, when the guests are this cute it's hard to say no! 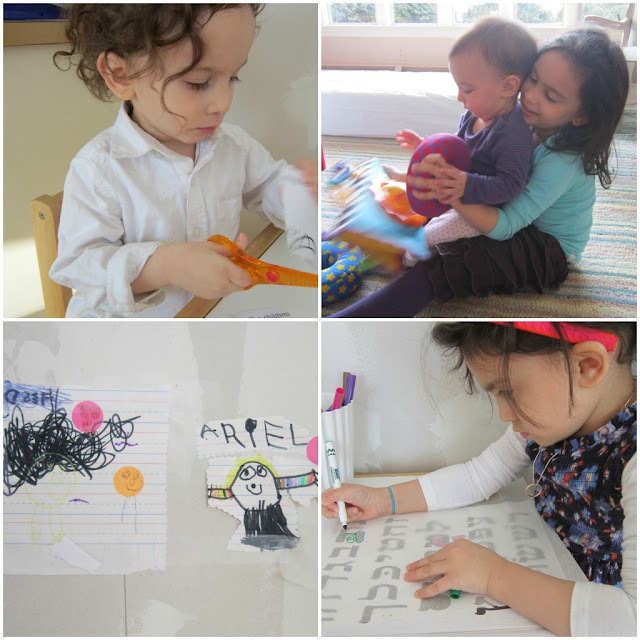 Clockwise from top left: Yosef loves to cut paper with his "safety scissors"; Moussia is such a good big sister; I let them tape artwork to my walls since they need to be painted soon; tracing paper makes it easy for Moussia to trace the Hebrew letters. Clockwise from top left: Zelda is now five months old! 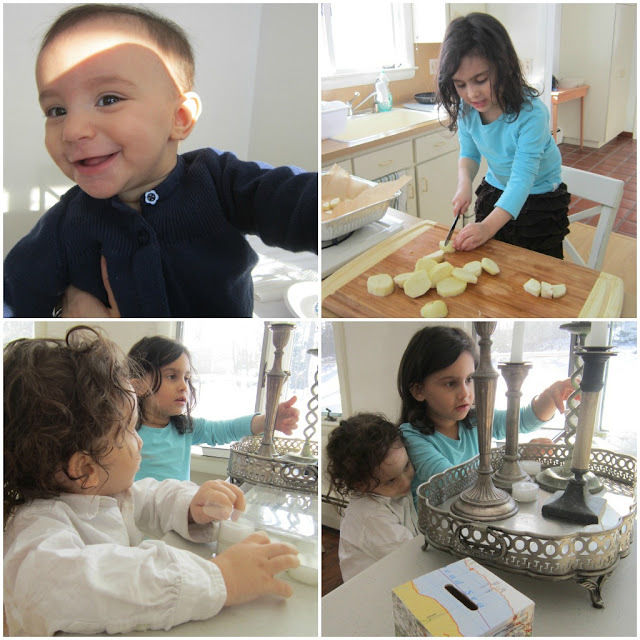 ; Moussia helped cut up potatoes for the Friday night meal; Yosef and Moussia prepare all the candles for Shabbat candle lighting. 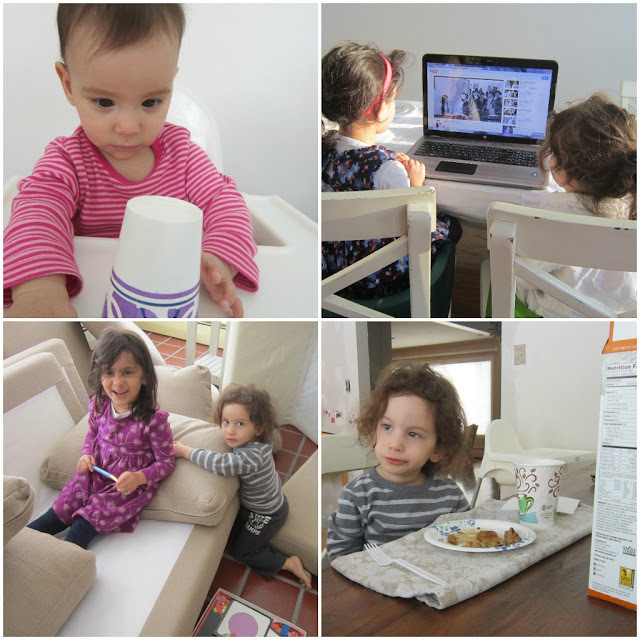 Clockwise from top left: Zelda just started sitting up in the high chair this week; a favorite video; playing on our new Ikea Karlstad sofa--not quite assembled; Sunday morning breakfast. looks like you had fun! the kids are so cute ba"h! We did have fun--thanks for your message! Anthaison chuyên cung cấp máy đưa võng chất lượng uy tín may dua vong tu dong gia bao nhieu hiện nay, là địa chỉ bán máy đưa võng giá rẻ hay địa chỉ bán võng điện tốt nhất cho bé hiện nay.